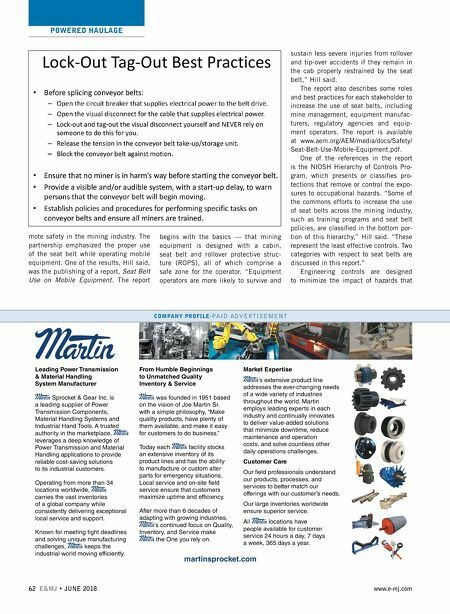 POWERED HAULAGE JUNE 2018 • E&MJ 63 www.e-mj.com Scan for more information HEAVY-DUTY CONVEYOR PULLEYS Drum Pulleys Wing Pulleys Clean Flight ® Wing Pulleys Engineering Class Pulleys CEMA C, D, E IDLERS Troughing Idlers Equal & Unequal Impact Idlers Self-Aligning Impact Beds Galvanized Frames Offset Troughing Wide Base Idlers Transitional/Adjustable Idlers Channel Insets Flat Carriers Return Idlers V-Return Idlers Inverted V-Return Idlers Live Shaft cannot be eliminated or substituted. For mobile equipment, engineering controls can take the form of active control, such as interlocks that prevent or stop the ma- chine from starting or running until a des- ignated choice is made by the operator. Other examples include ignition switches and the seat belt switches. These are con- sidered active controls because they can stop machine operation until a designat- ed action is taken. Engineering controls have advantages and disadvantages, Hill explained. "One of the advantages is that it does require the operator to use the seat belt to oper- ate the machine," Hill said. "On the other hand, some devices can be complex." 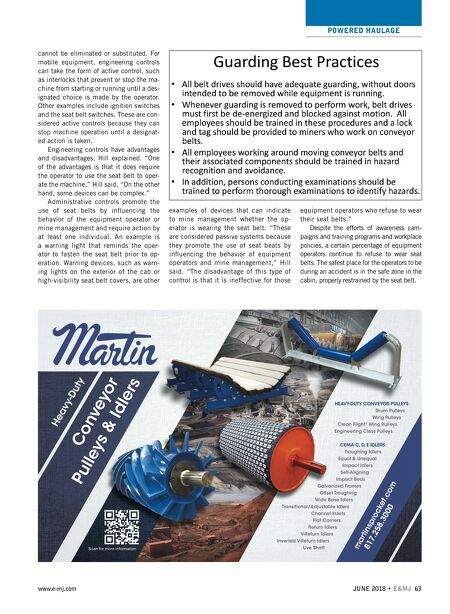 Administrative controls promote the use of seat belts by influencing the behavior of the equipment operator or mine management and require action by at least one individual. An example is a warning light that reminds the oper- ator to fasten the seat belt prior to op- eration. Warning devices, such as warn- ing lights on the exterior of the cab or high-visibility seat belt covers, are other examples of devices that can indicate to mine management whether the op- erator is wearing the seat belt. "These are considered passive systems because they promote the use of seat beats by influencing the behavior of equipment operators and mine management," Hill said. "The disadvantage of this type of control is that it is ineffective for those equipment operators who refuse to wear their seat belts." Despite the efforts of awareness cam- paigns and training programs and workplace policies, a certain percentage of equipment operators continue to refuse to wear seat belts. The safest place for the operators to be during an accident is in the safe zone in the cabin, properly restrained by the seat belt.